Guide to Blast Cleaning, Shotblasting - Centurywise Ltd. 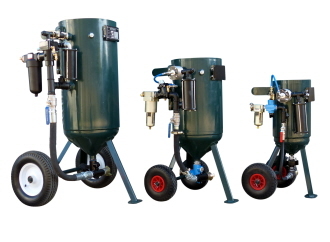 This is intended as a very basic guide to the equipment required for operating a mobile abrasive blast cleaning business. It is written as a result of numerous requests for information emailed to our Ebay site, and is intended simply as a guide for the total beginner. Thus , I have steered well clear of technicalities and techniques, and have only included just one essential chart. A blast cleaning set-up consists of just 6 main pieces of equipment, with associated accessories, and abrasives. You will require a diesel engined mobile compressor. They are rated on their air output cfm ( cubic feet per minute)... usually 140, 180, 260 & 350 cfm, and manufactured by the likes of Atlas Copco. Ingersoll Rand, Compair , Sullair & Kaeser. 140 cfm : The lower end of the scale. These are small, lightweight, easy to tow with a small van, easy to source and miserly on fuel. But you are limited to cleaning just lightly soiled stone, brick, steel and wood, and the cleaning rate will be generally slow. 180 cfm : Firm favourite with one-man band businesses, my favourite size compressor, as again they are light, easy to tow, fuel efficient, and not too tiring to use all day. Formidable when used with a C50L blast pot; I owned this combination for many years , and was been able to clean virtually every job I encountered. Biggest problem is that they are quite rare and difficult to find, as they are too big for road gangs and too small for other industries. 260 cfm (as in photo above) : Very popular with small/medium size businesses and hire companies. Weighing in at around 1400kg , you need a decent size van to tow. Can be used with any size blast pot and is fairly common. Makes rapid work of large areas of stone, brick and rusty or painted steelwork... Ideal for large buildings, allows use of long lengths of compressor and blast hose without losing too much power. 350 cfm : The biggest of the mainstream mobile compressors. For use where a seriously fast cleaning rate is required on heavily corroded steelwork... ships, bridges, structures, heavy machinery, etc. Heavy on fuel and cumbersome to tow. A few days use can be very tiring ... just about every muscle in your body will know about it ! Four sizes available : the 1 bag C20L, 3 bag C50L, 8 bag C140L, and the 12 bag C200L. Each suitable for a variety of applications. Pots are supplied with manual controls ( two on-off ball valves), or with a remote valve, controlled by the operator using a deadman handle at the end of the blast hose. 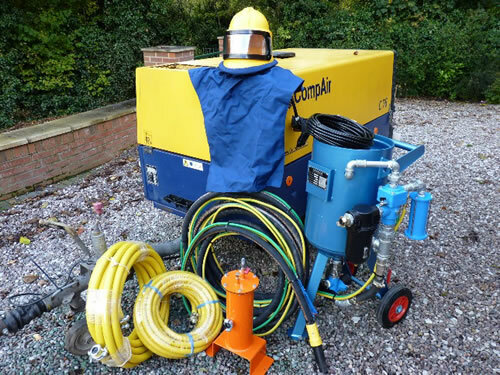 The 20L holds just 25kg of expendable abrasive, enough for 10 minutes of continuous blasting. Useful for small or limited access jobs, for snagging & touching up, fine detail restoration work, or in workshops for occasional blasting. The 50L ( as in photo at top of page) holds approx. 75kg of expendable abrasives, enough for 30 minutes of blasting. Easily the most popular size pot with jobbing one man businesses. Very manouverable on building sites and easy to load in and out of van. The 140L holds 200 kg of abrasives, enough for 90 minutes of continuous blasting. Popular with firms involved with medium / large cleaning projects. The 200L holds 300kg of abrasives, sufficient for 2 hours blasting. Monster size pot for for big projects where as little down time as possible and a rapid cleaning rate is required. In reality a full pot (allowing for inevitable stopping and starting) will last half a shift. A free standing large charcoal filter pack designed to remove oil mist, moisture and odours from your compressed air supply. Boron alloy : Entry level throwaway nozzles. Cheap and cheerful, don't last very long, and are designed for use in projects where management requires precise costing , or for the occasional use blaster. Tungsten carbide : Long lasting but usually in a heavy metal jacket. For use in harsh environments like shot blast bays. Silicon nitride : Easily the most popular and versatile nozzles. 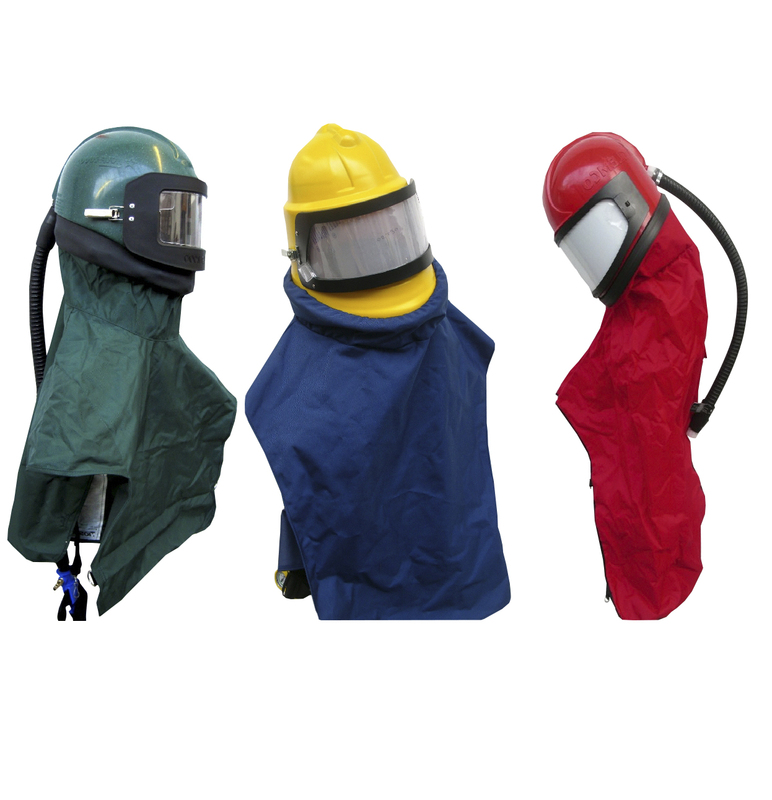 Very hardwearing lining in a lightweight jacket , allows for excellent operator comfort and increased productivity. Good quality products will last a long time, choose carefully though, there are a lot of dealers selling trash from the Far East. This is a very general list... Always carry out test panels to determine desired pressure at nozzle. 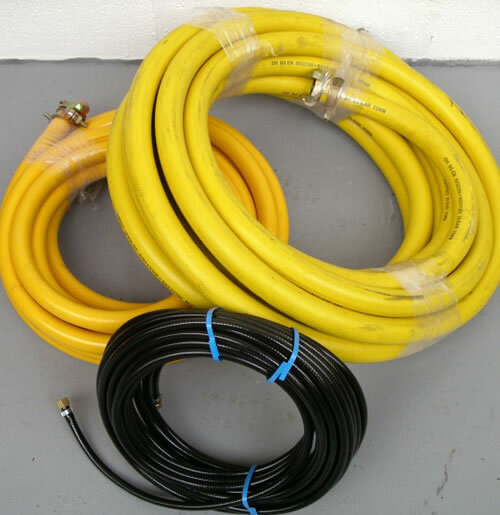 You will require two compressor air hoses ... one ¾" i.d. to connect to the helmet filter and a 1" or 1 ½" i.d. hose for the blast pot. A 15 metre length of each is usually sufficient for most jobs, but it is prudent to carry an extra length of each. You will also need a 20 metre length of ¼" i.d. helmet air line, again it's always worth having a spare coil. There is a multitude of different abrasives available, and this isn't the time or place to delve into it all. With regards to expendable abrasives, we stock 4 grades of Recycled Crushed Glass ( as photos below ), and they cope very efficiently with most jobs. We also stock many other abrasives , such as Garnet, Aluminium Oxide, Chilled Iron, Plastic Media, Walnut Shells, and Glass Bead. Silica sand : is still very widely used because it is cheap and cleans most surfaces with great effect. There is huge confusion as to whether silica, ( A.K.A. kiln-dried and block paving sand) is illegal to use for blast cleaning.... It is banned ( wet or dry blasting) for cleaning so called 'articles', (ref : Factories act 1949 & 1961 ) which according to HSE guidelines encompasses a wide variety of metal objects from small castings to ships . Amazingly, these objects do not include buildings and even bridges . However, normal Risk, Duty of Care and COSHH assessments prevail, and the safest and most effective media available for each particular job should be used... in other words ... use something else , as you will almost definitely be breaking the law. Wetblasting with silica sand ... Most blasters think this is a safer option than dry blasting, ... unfortunately though this isn't so, damp crystalline silica clings more easily to lung tissues than dry, causing possibly irreparable damage ... Google 'silicosis', the pictures are nasty. There is probably one scenario where you could use silica sand ... 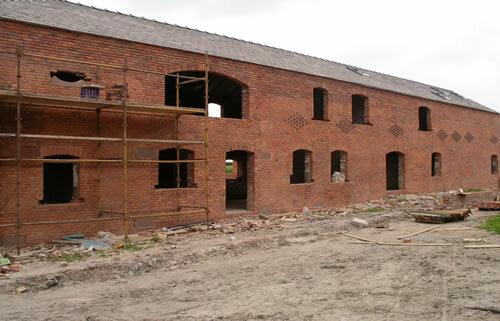 If you are a private individual, blasting soft substrates ( brick, stone, timber ) in the middle of nowhere with correctly maintained respiratory equipment, no-one else on site , and a plausible plan of action to properly remove dust debris, then a passing HSE officer will have nothing much to complain about. In reality it's just not worth the worry, as there are many alternative blast cleaning abrasives. Common sense ... However, if you are dry blasting a car chassis, or a wagon, in a yard or enclosed building, with silica sand, with other people in the vicinity , you have no risk assessment, you are unable to demonstrate sufficient dust control measures, and you are using poor equipment, then the HSE officer will stop proceedings and issue an Improvement Notice . They will give you fair time to comply. If you do not comply you could easily be looking at a £25K fine. NB...It is also totally illegal for an employer to force an employee to use silica sand for blasting under any circumstances. Domestic use... :Blasting with silica sand at home, whether in a cabinet, round the back of your garage, or in a big open space, is also a big no no. How Much Can I Expect to Blast in a Day? and finally.. look out for the cheap and nasty cloned products with their dodgy ISO ratings flooding the market from the Far East. Particularly blast helmets, blast nozzles with super thin linings, nylon hose couplings that shatter after a week, very thin metal couplings, and garbage blast hose. THE ABOVE IS PROVIDED FOR GENERAL INFORMATION PURPOSES ONLY, AND DOES NOT IMPLY ANY SPECIFICATION. THE DATA HAS BEEN COMPILED FROM SOURCES CONSIDERED ACCURATE. THE USER SHOULD SATISFY HIMSELF THAT ANY PRODUCT IS ENTIRELY SUITABLE AND SAFE FOR HIS OWN PARTICULAR PURPOSES. IT IS THE RESPONSIBILITY OF THE USER TO DETERMINE THE BEST PRECAUTIONS NECESSARY FOR THE SAFE HANDLING AND USE OF ANY PRODUCT FOR HIS UNIQUE APPLICATION. THIS DATA SHOULD NOT BE CONSTRUED AS ABSOLUTELY COMPLETE, SINCE ADDITIONAL DATA MAY BE DESIRABLE WHEN PARTICULAR CONDITIONS OR CIRCUMSTANCES EXIST. CENTURYWISE LTD. DO NOT ACCEPT ANY LIABILITY WHATSOEVER ARISING OUT OF THE USE OF THE INFORMATION, OR ANY USE, APPLICATION, ADAPTATION, OR PROCESSING OF THE PRODUCTS THEREIN, AND EXPRESSLY DISCLAIMS ANY LIABILITY FOR ANY INJURY OR LOSS ARISING FROM THE USE OF THIS INFORMATION OR THE MATERIALS DESCRIBED.